Can a jacket make your heart skip a beat? I’m not going to lie, when I saw this jacket on my ASOS screen… my heart did skip a little, tiny beat. I became panicked my size would be sold out (it wasn’t) and it would disappear from the website forever (it hasn’t) So all in all, things turned out a-okay. In the process of owning this jacket I have made sure to spam you guys with it because erm, HELLO, can you see it?! It’s the prettiest cord jacket I’ve ever seen and I’ve also figured out that lilac is my colour and I now need more, more and more to fill my “already full” wardrobe. But isn’t Summer almost over?! I hear you yell out before you press the ‘purchase’ button – I had the same fears. However when you love something you make it work, right? So I plan on wearing this all year through – even on Christmas day if it will have me. I’m thinking all black outfits with chunky boots and a lilac jacket. Muted toned dresses with tights and a lilac jacket. Thick polo necks, chunky jumpers, cropped jeans with a freakin’ lilac jacket. Hell, I’ll even wear my PJ’s with a lilac jacket. And there you have it. In just a few minutes I’ve managed to write a couple of paragraphs all about a lilac jacket. I believe I am truly obsessed. 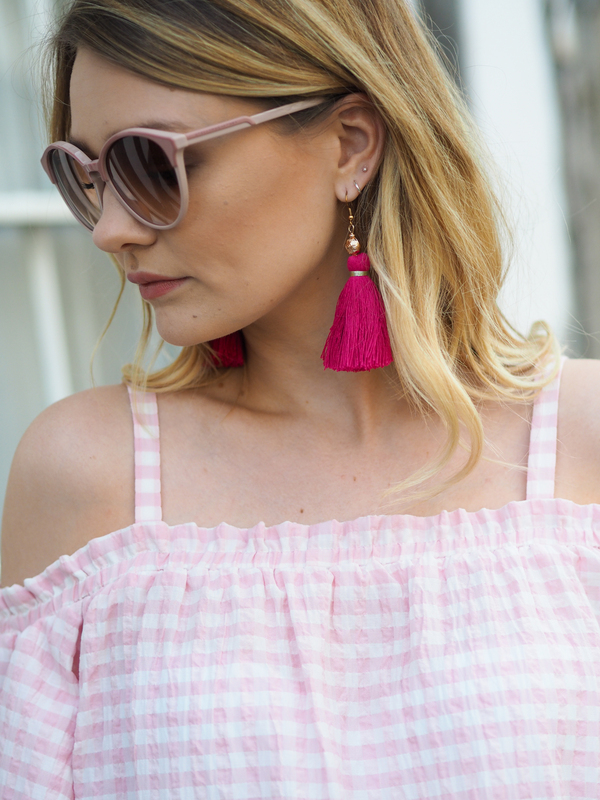 So they don’t feel left out, I’m also loving this pink gingham off the shoulder beauty which I picked up in the Miss Selfridge sale recently, hel-lo £12 bargain of the month! I decided to try and get some wear out of these jeans too which were also a sale find via Zara, but many moons ago. 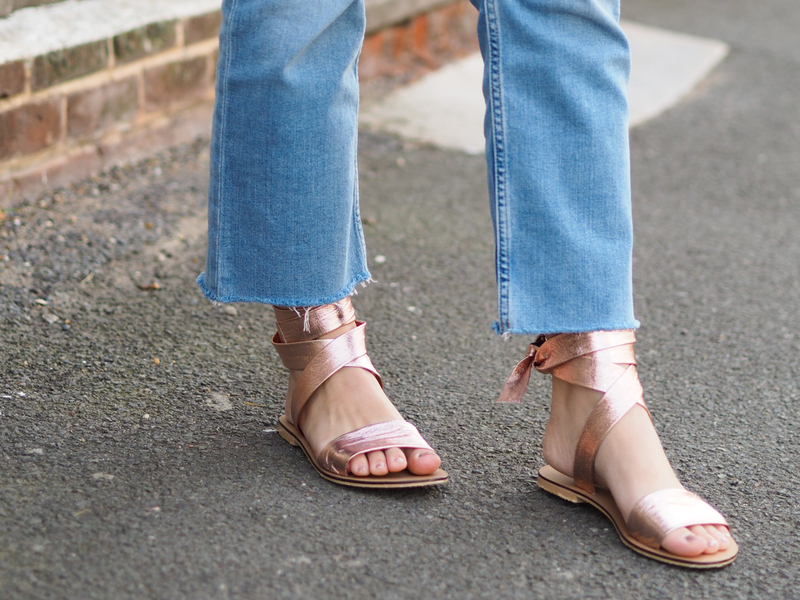 I brought them after a really bad hair cut in Covent Garden to make myself feel better but it was also before cropped jeans were officially back in fashion, so they just got pushed to the back of the pile (so sorry jeany baby) But now I love ’em so it’s all good. 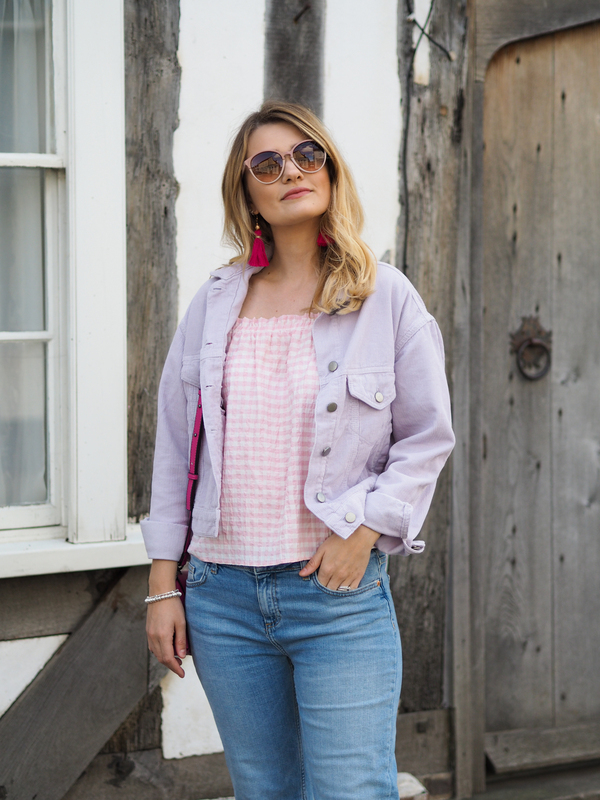 Lastly, the rose gold tie up shoes which are surprisingly flattering, the brightest bag I could find in Topshop and some big ol’ Pat Butcher earrings (which I customised a little) These sunglasses have also lasted me through many Summers and yes… many blog shoots. When I first got them I definitely judged the colour as “something I’ll probably never wear but I have to keep them regardless” Oh, how wrong I was because I actually wear them all the time, turns out pink is super easy to pair up afterall and I lurve the retro shape, so cool, so funky, so fresh.